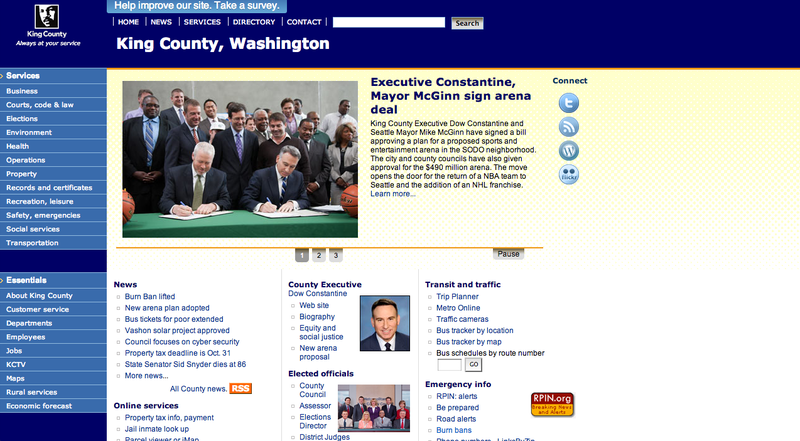 Site name and Description – Washington State, King county’s official website for the residents and visitors. The site has a list of services, innovative government initiatives and all the information regarding King county including the governing body, key people, online services, transportation details, jobs, employees, maps, contact, directory and more. Mission – King County government provides fiscally responsible, quality-driven local and regional services for healthy, safety, and vibrant communities. Design overview – Logo is isolated and lacks prominence; the site appears cluttered and content heavy. Typeface is a regular Arial and not legible hence, does not encourage reading. Information is scattered all over the layout with improper flow of dominance to elements and aesthetics. There is no uniformity in terms of design and layout because the font, colors and positioning of content change page to page. Overall, the site needs to be revamped in terms of design, information architecture and content. Social media integration – “CONNECT” at the top right side of the page for social media. Technologies used – HTML, Java and Word press.